University of Vermont received a A.
U.S. News & World Report's ranking of 35 out of 117 of National Universities Top Public Rankings was a major contributor to this grade. The University of Vermont offers a solid overall academic reputation, accessible professors, and a great hockey team. UVM is particularly strong in animal science and health- and environment-related areas; students report that psychology, political science, and business and management majors are also popular. Describe the type of student who should not attend University of Vermont and explain why. One who does not like the cold weather, and who is not capable of opening up to a community of people. 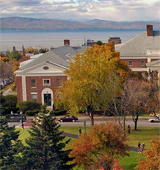 What are the top 3 reasons someone should attend University of Vermont? Burlington, Vermont is a wonderful college town. UVM has a huge range of academic offerings which allows you to try lots of different things. There is a great sense of community of campus. What is a typical University of Vermont student like? Describe the type of person that should attend University of Vermont. UVM's academics, research opportunities, and price tag are more akin to those of a private institution. UVM offers an array of unique classes like the History of Rock and Roll; The Role of Drugs in Society. More than half the student body originates from outside of Vermont. The diversity of extracurriculars and academic interests ensure that not everything is one-sided. What are the top 3 things that students do for fun at University of Vermont? 96% of students graduated in the top half of their class. The average student pays $15,793 for tuition, fees, and other expenses, after grants and scholarships. Total stated tuition is $13,728, in-state and on-campus, before financial aid. Learn more about financial aid at http://www.uvm.edu/~stdfinsv/. Estimate the net price for you at http://uvm.studentaidcalculator.com/survey.aspx. The typical (median) early career salary of University of Vermont graduates is $44,000, according to Payscale. University of Vermont participates in the NCAA Division I-AAA for college athletics. Want more info about University of Vermont? Get free advice from education experts and Noodle community members.